“These taste even better now than they did in the summer!” remarks my son Montana, as he licks a frozen popsicle on this clear January day. Indeed. In the dead of winter, our bodies are longing for scarce fresh vitamins and antioxidants, so these fruity treats taste simply heavenly. And anything tastes better than yesterday, when Tana was rolling nauseously around the couch for hours, battling a virulent stomach flu. “This is the worst day of my life!” the poor little guy said, and then deliriously punched the couch, insulted that life was treating him so harshly! I assured him that everyone goes through this barfing ordeal at some point in their lives, though I suppose my words were small comfort. Despite the fact that all three of us were bellyaching, all in all, our little family had a surprisingly enjoyable day. We lounged around in front of the fire, ate plain rice overcooked in chicken broth, and told lots of stories. Doing all the things we don’t usually make time for in the rush and bustle of our busy lives. Sickness has its benefits, slowing us down long enough to cuddle and listen to the rain. But why do we wait for a flu? Today, his tummy is more settled and we are on the couch again, recovering. With Tana is still in his jammies by late afternoon we both had a case of cabin fever. I thought it would be a good idea to get some fresh air and cool sunshine. But the only way I could convince him to go outside was by letting him keep his pajamas on under his jeans and coat, so he could be right back in ’em when we got home. The beach was unusually warm for a January day! Not a lick of wind and the sun was shining hard off the water. I’d spent a couple hours doing admin tasks online while Tana played Legos. But screentime truly makes me feel insane, and after almost two whole sickdays indoors, I needed a walk! I felt so grateful when my mukluks hit that sand, and I spotted my friend otter right away. I watched her tearing up her catch while the tide rose, shrinking her feasting rock little by little, by and by. A pair of buffleheads paddled by. “They have mohawk haircuts!” noticed Tana. After a few hours of the flattening blue glow of my computer screen, my senses started opening back up, and my attention turned again to my sensations. I’m a bit woozy and gimpy, with a sore belly and a chronic limp, but I’m alive, so alive, and grateful to be here in the sun on a winter day, with my son at play, in good spirits. This is our favorite spot on the beach. A spot I have been coming to for years, before Tana was born, before I met Keeth, even. I’ve danced here, I’ve sang my prayers here, I’ve made offerings to the cliffs and the caves, and the sea. I’ve come with friends for breathsucking swims in the cold water. I’ve come here alone, very pregnant, knotting prayer ties around the branches of the tree that I hoped my son would one day play on. And now, he is here, climbing the lookout tower on his driftwood ship. The profundity of it did not escape me today. I am living in beauty. I am breathing beauty. There is beauty all around me, limp or no. I wished for this years ago, while still a maiden, and today I am here in an aging body, glimpsing my own death. Who knows how many more times I will be so lucky to visit this soaring place of heron and eagle and pigeon guillemot? Becoming a mother has taken all I have to give, has “brought me to the mat” over and over again, just as it as rewarded and ripened me all the same. The hitch in my hip and the trick in my knee are constant reminders that I will not walk this beach forever. More than ever before, I can feel the bittersweetness of departing, as the sky darkens, and it is time to head to home and hearth. I feel the longing to stay here forever, but dinner needs prepared, animals fed, dishes scrubbed. With a quiver of longing in my lips, I say goodbye to this place and practice breathing its golden rosey glow deep inside me, into my bones somehow, trying to remember how to take nourishment from sand and sunset. On the way home, I pull the car over to our neighbor’s place–they have grid power, and let us keep a chest freezer there. I have six quarts of bone broth to stack inside, and more bubbling on the kitchen stove. Putting up the harvest is a homesteaders’ way: the freezer is packed to the gills, difficult to manage. But I spy a hint of blue in the corner–homemade popsicles! Just two remaining from the summer bounty, one for each of us on this special day, just me and my son. We listen to the good vibrations of the Okee Dokee Brothers, and let the sweetness of blackberries and roses linger on our tongues. I don’t know that I’ve ever tasted anything better. Not only because we are just getting over a sickness, and our winter bodies are aching for the wisdom of summer fruits. But because these are special popsicles, made fron a ritual harvest of Rosa rugosa, back around the other side of the seasonal wheel, in Summer. Seven gallons of petals to be exact! Back in June, I’d spent some time meditating upon my mother’s people, inquring what wisdom they might share with me. 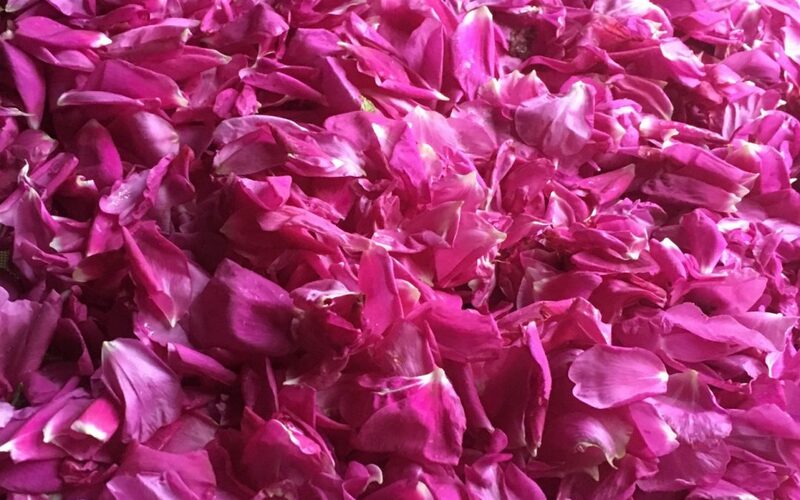 I heard a message that they are “People of The Rose.” And, after generations of neglect, I was asked to revive our age-old practice of working with roses, for beauty, for fragrance, for food, for medicine. A request was voiced to use my hands, to feed the lineage by making a rosary in the traditional way–fashioning beads out of real rose petals. 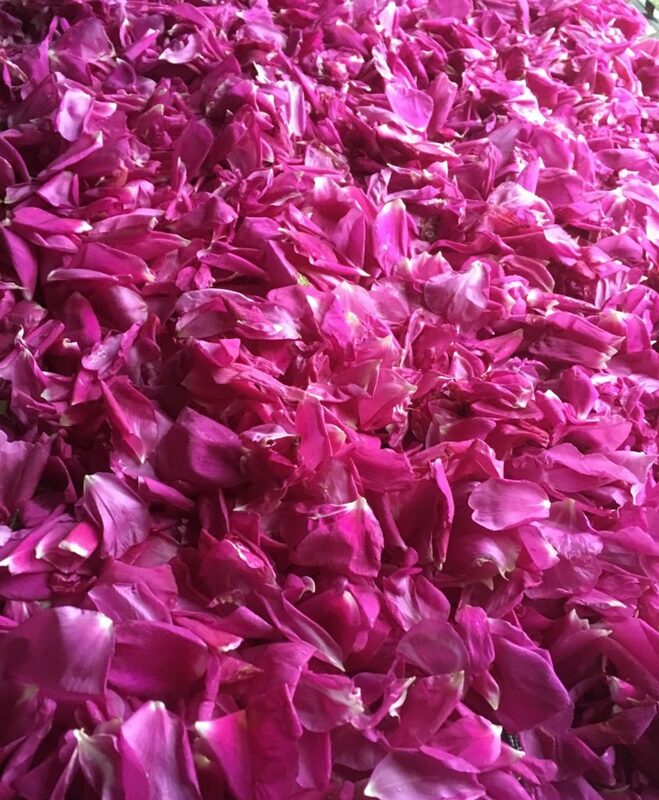 In the height of summer, I put fresh rose petals–from the bush my mother planted!–in a blender with a bit of water, and then simmered them for hours on a ultra low heat. Then I strained them through some muslin. A rosy, milky liquid flowed out of a large lump of rose “clay,” which I shaped into dozens of tiny beads, and set in the sun. When dry, I strung the rosy globes into a rosary “mala,” and consecrated them as a ritual tool of protection, which I maintain by rubbing with rose essential oils, an wear regularly anytime I want to connect with this long line of ancient Rose Grandmas. My Grandmothers name was Rose. And the rose milk? Of course, this rare and precious liquid was not washed down the drain! I mixed it with fresh blackberry juice, milk, and honey and froze it into ritual popsicles. The most delicious thing one could put on a tongue, I can assure you! To be delighting in these, in the middle of winter, just after being worked over by a stomach bug, heightened the enjoyment to ecstasy, and perfected the day with a little unexpected popsicle magic. It is in moments like this that a ritual investments can pay off in surprising ways, a rose popsicle in winter calling me back from a lonely and fragmented world, to a long line of deeply well bodies, surrounded and suffused with roses, grandmothers upon grandmothers stretching back to the horizon of time.